Columbia, Mo. (Nov. 20, 2018) — Missouri School of Journalism senior Claire Mitzel has been named the 2019 recipient of the Homer L. Hall Scholarship. 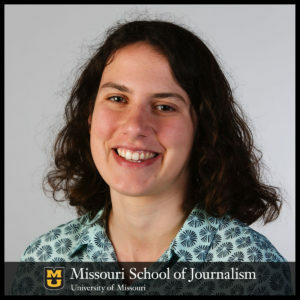 Winner of the 2019 Homer L. Hall Scholarship, senior Claire Mitzel grew up reading local newspapers, saw the value of their role as community watchdog and hopes to put her #MizzouMade investigative journalism skills to good use. The Roanoke, Virginia, native has spent the past two years working as an assistant city editor and reporter for the public safety and health beats at the Columbia Missourian, the school’s digital-first community newspaper. Mitzel also interned for The Virginian-Pilot in Norfolk, Virginia this past summer. She’s covered topics ranging from bullying to the U.S. opioid epidemic. It’s that dedication to community journalism that inspired Hall to select Mitzel for the scholarship. Mitzel plans to continue her work next semester on the Missourian’s interactive copy-editing desk. She says this scholarship will help subsidize her time there. A pioneering, award-winning journalism teacher, Homer L. Hall inspired thousands of students during his 36-year career. A Missouri Teacher of the Year and a Missouri Journalism Teacher of the Year, Hall is one of only two advisers to be recognized as the National Newspaper Adviser of the Year and the National Yearbook Adviser of the Year. His first textbook, “Junior High Journalism,” published in 1968 and last revised in 2008, is considered to be the preeminent publication of its kind. Hall graduated from the University of Missouri in 1960 with a bachelor of science degree in education. An alumna of the J-School established the Homer L. Hall Scholarship to honor her Kirkwood, Missouri, junior high and high school journalism teacher. Gifts to support the annual Homer L. Hall Scholarship can be made by visiting the Giving to Mizzou website.